Since I love playing games – video games, board games, cards, what have you – I have found that adding a bit of gaming spice to tasks really helps motivate me. This app essentially turns your reading sessions into infographics. Once you finish the book this way, the app populates a fun infographic with all kinds of stats about how you read the book. It includes things like your total reading time and your reading speed in pages per hour. There are also achievements to unlock by completing book reads, building up your reading streak days, and more. Added bonus: As you are using the app to read a book, it calculates the remaining time you will need to read in order to finish the book at your given pace. Running is not my forte. I’ve always said that the only way to get me to run is if a zombie is chasing me. Well, apparently I wasn’t the only one! This app is for people like us. 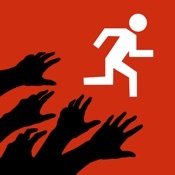 The app turns your runs into missions set in a zombie apocalypse. You can listen to your own music and the story will simply interrupt when needed. As you run, you are uncovering more of the story and you even collect supplies to build your base. Added bonus: You can turn on a setting to include random zombie chases. When it tells you a zombie is on your tail, you have to increase your running pace a bit in order to successfully escape. That’ll get you in shape quick! What are some of your favorite apps to turn chores/work/jobs into games? This is a silly one, but I do like using Pokémon Go as a reason to go on a walk/run :). Gotta catch ’em all! That’s a good one, especially since you’re smart enough not to walk into a highway or off a cliff. I had it on my phone for about 1.25 days and then I lost hope. There weren’t any of those buggers anywhere near me.